This officially licenced full length zip hoodie from Super Mario Bros. is perfect for fans of the series. 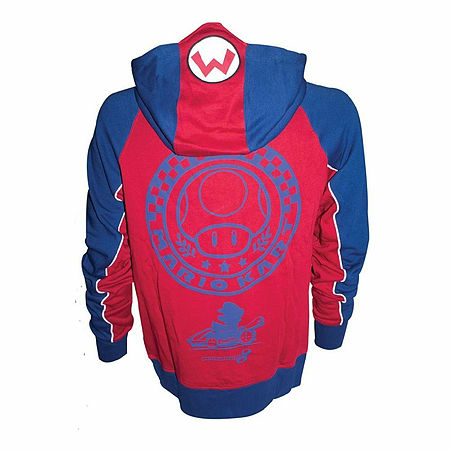 Made high quality cotton and polyester materials it features an peaked hood with the Mario symbol, which can be adjusted for custom fit.Made from 60% cotton and 40% polyester this distinctive Red/Blue hoodie features small motif on the left-hand chest, of a mushroom surround by a laurel racing circular wreath.On the back of the hoodie you will find a much large version of the front motif, underneath which is Mario Kart 8 logo. Perfect for fan of the gaming series.